Kevin Osborne is an amazingly talented singer, trombonist, musical arranger, and band leader. 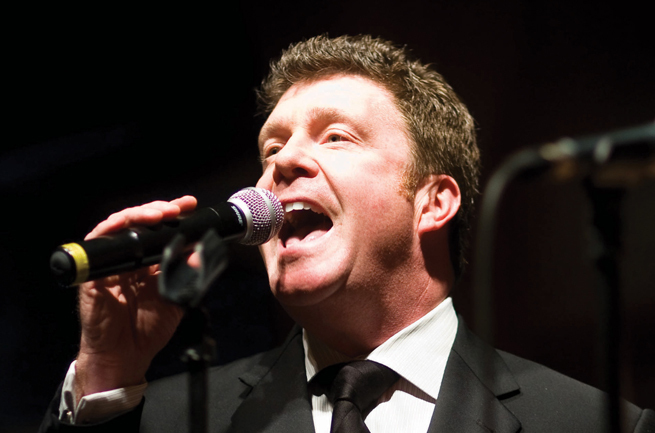 A graduate of the prestigious New England Conservatory of Music in Boston, Kevin has been asked to perform, record and tour with many of the biggest names in the music business including Aretha Franklin, David Bowie, Frankie Valli, Bon Jovi and more. Kevin’s band has backed up both Stevie Wonder and Sting at a charity event for the Friars Foundation and has performed at the weddings for celebrity clients including NBA star Carmelo Anthony and NASCAR superstar Jimmy Johnson. An original Broadway cast member of the Billy Joel musical “Movin’ Out,” Kevin was chosen by Billy Joel to be one of his background singers at the historic closing concerts for New York’s Shea Stadium, called “The Last Play at Shea.” Kevin had the honor of not only backing up Billy Joel, but John Mayer, John Mellencamp, Garth Brooks and Sir Paul McCartney. The Kevin Osborne Band has remains one of the most popular and sought after live bands on the private party circuit in the New York area. His band has performed at hundreds of weddings, corporate parties, charitable galas and special events over the years, including the Tony Awards Gala and at a number of Broadway show opening night parties. It was a true pleasure seeing you on Saturday night at our dear friend’s daughter’s wedding. I can only say this – we heard you the first time at Michael’s wedding 5 years ago maybe? Then we heard you at his sister Heather’s wedding, then you played at Robin’s daughter Harleigh’s wedding (Robin and I go back 40 years) and then I made sure that Nancy hired you for her son Eric’s Bar Mitzvah. Get the picture? When Judy called me with a wedding date, I insisted she book you before she had THE SPACE – I said “Judy – do not even listen to another band: Kevin is your man” and Judy went ahead and booked you. Judy is thanking me over and over again and so did Nancy and Mark after Eric’s Bar Mitzvah. In all my party going years filled with wonderful events, I have never heard a band better than yours. YOU make the party, period. End of story. The food, flowers, room- it all matters but…. Everyone cares most about having a wonderful fun time dancing and you make it all happen. You have presence, style, polish and an understanding of the rhythm of a party and crowd that no other band leader has. Your voice is the best and you always put together a great group. My husband and I went on our usual jog on Sunday after getting home at 2 am and our legs felt like we had run a marathon the day before. I can go on and on but you get the point. My husband Paul and I are determined to come up with an event in the future (we don’t have children) so we can hire you. We will – it’s only a matter of time. 70th birthday, retirement? , anniversary whatever! We love to entertain and what better way than to share your marvelous talent with all of our friends. You ARE the best. Returned on Saturday from two weeks in Italy, and I cannot reiterate enough how THRILLED we are with how everything turned out. We had the best time ever and I'm dying to find another opportunity to save our pennies and have you guys party with us again soon! The songs and overall vibe of the night were so special, and we really feel like that was all due to the amazing performers you have in your band! Thank you (and Erik!!) so much for all of your help and patience in helping us throw the best party ever. We had a ton of people who go to weddings all the time and they said we had the best band they had ever heard. We will likely be connecting you with a few newly-engaged couples very soon! Thanks again! Hope to keep in touch with both of you! Josh and I want to thank you from the bottom of our hearts for everything you did for us yesterday. Our day was complete magic! You definitely went above and beyond anything we could have ever imagined. I am so so so happy Karen recommended you to us!